He’s grown so much over the last year that he needed something bigger! Patrick Colson is one of Romano Viazzani’s star students. He started piano lessons from scratch in 2012 and has made steady progress to the point where he is now studying for his Grade 8 Piano. 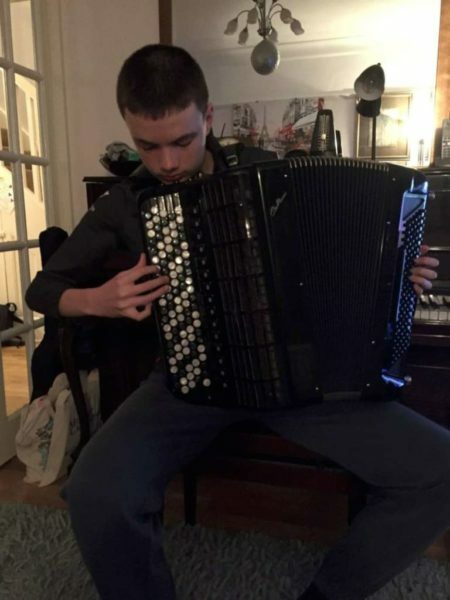 About three years ago, witnessing his phenomenal progress on Piano, Romano Viazzani suggested he might like to try out the accordion too. He agreed and purchased a small classical button accordion with a converter mechanism so that from the start he could learn both the Standard and Free bass systems. True to form, he made rapid progress on this instrument too. Meanwhile at secondary school he also took up the drums and the clarinet! Patrick is very creative and loves composing music too. Now a teenager, he has made rapid progress size-wise too! His small student instrument was starting to look like a toy on him so he wisely invested in a full-sized professional instrument. Luckily a very nice previously-owned instrument was available which belonged to Mauro Carra who sadly recently gave up playing professionally. Happily this wonderful instrument has found a new home in the hands of an emerging young musical talent. Patrick’s Beltrami CVC5 is a double cassotto 64/120/58 converter instrument with the usual reed configuration in the right hand manual of 16’C + 8’C + 8′ + 4′ and with % sets of reeds in the Left-Hand manual with 3 sets of the free bass reeds configured as 8′ + 8′ + 4′ plus octave doubler. It has a wonderfully warm, played in sound from its hand made Voci Armoniche reeds. 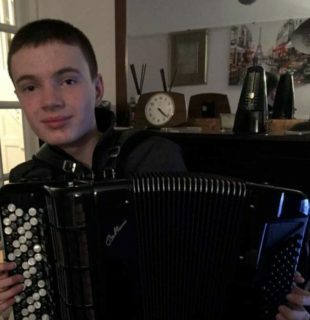 I have a feeling we’ll be hearing a lot more from Patrick in the future if he maintains his rapid learning curve, and it’s lovely to see a new generation of young people choosing this most wonderful and versatile instrument that is the accordion! This entry was posted in News and tagged accordion, Patrick Colson, Romano Viazzani.